Can doing yoga really strengthen your bones? If you’re looking for yet another reason to hop on your yoga mat, stronger bones is one of them! Weight-bearing exercises have long been recommended to prevent the progress of bone loss as we age. Working in pharmacy, I hear Doctors recommend this daily. But yoga isn’t often the first form of weight-bearing exercise that comes to mind, right? Yoga is unique in that it not only involves weight-bearing strength work, but also balances it with flexibility. Think about it. In a typical yoga class, you’re holding up your body weight in standing postures like Warrior 1 and Warrior 2, where you’re engaging and strengthening the muscles around your bones. You have postures that focus on balance and co-ordination, like Tree Pose and Dancer Pose. And how can you forget plank pose in a Sun Salutation, which is largely weight-bearing and can stimulate bone growth. 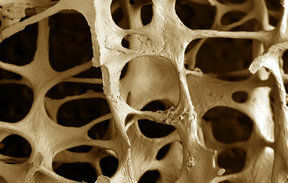 So what is the bone-loss condition Osteoporosis and what are its risks? Osteoporosis is a condition that thins and weakens bones, making them more porous. Men and women acquire the maximum bone mass by 30. Once you’re 30, your bone density mass declines. Menopause can accelerate this process too, causing bone mass to decline sharply. As bones become less dense, they weaken and are more likely to break. How to prevent it, you ask? The key to unlocking the bone strengthening benefits of yoga lies in doing yoga at least 2-3 times a week, while holding postures for 10-15 seconds. Below are 9 weight-bearing yoga postures that you can add to your practice. It’s best to be under the guidance of an experienced yoga teacher to make sure you avoid any injury. As well as yoga, 10-15 minutes of daily sunshine for a boost of Vitamin D and eating foods high in Calcium can help keep your bones strong and healthy!